Before a game against the Houston Rockets earlier this month, Toronto Raptors head coach Nick Nurse was asked about game-planning for James Harden. “He messes things up because he can score 50,” Nurse said. Any other season, that might sound like hyperbolic praise for the opposing team’s star, but in a season where Harden is rewriting the possibilities of what an offensive player can do to a box score over 48 minutes, what Nurse said was a statement of fact. Harden has scored 50 points eight times this season. Last week, Harden scored 57 in an overtime loss to the Memphis Grizzlies (the second time he’s scored 57 points against the Grizzlies this season, if you can believe it) then followed that up with a 61-point performance in a win over the San Antonio Spurs. The 118 points combined was the most points scored by a player in consecutive games in 50 years. The statistical anomalies to Harden’s incredible season don’t stop there. He has six games with at least 57 points this season, the most of any player in NBA history other than Wilt Chamberlain. He’s the fourth player in league history, alongside Michael Jordan, Kobe Bryant and Chamberlain to have multiple 60+ point games in a single season. He’s also the first player in history to score 30 points against every single team in the league. Tonight, the Rockets visit Milwaukee for a matchup against Giannis Antetokounmpo and the Bucks. The Most Valuable Player award is a two-man race between Harden and Antetokounmpo, who is having a career season—averaging 27.4 points, 12.6 rebounds and 6.0 assists—and has led the Bucks to the best record in the league. There are merits to both player’s case for MVP, but there’s no debate when it comes to the historical season Harden is having. He has normalized the 50-point game, a milestone many players see as a once-in-a-lifetime achievement. Damon Stoudamire played 13 seasons in the NBA and reached that mark once, in a 2005 game against the New Orleans Pelicans when he scored 54 points. Brewer wasn’t about to make things easy for his former teammate. He got up in Harden’s face, pestered the Rockets guard by picking him up full-court, and eventually drew an offensive foul from a visibly frustrated Harden near the end of the first half. The Sixers home crowd rose to their feet in appreciation of Brewer’s effort. It was an off night for Harden. He still ended up with 37 points. The night-to-night offensive numbers are staggering, but what can be lost in the highlight packages of Harden shaking defenders with a dazzling array of dribble moves and launching shots from another area code is that this is only one aspect of his offensive dominance. Jerry Stackhouse, now an assistant coach with the Grizzlies, scored 57 points in 2001 against the Chicago Bulls and to this day, still credits his point guard Mateen Cleaves for his career night. “He made sure no one was touching the ball in the half-court set but me,” Stackhouse said. For any player to score 50 points, they need the ball in their hands, and that is often the responsibility of the point guard. The equation is different for Harden, who has the ball in his hands for most possessions. He leads the league with a 39.6 percent usage rate. While he is putting up a ridiculous amount of shots per night, Harden isn’t just an offensive gunner who leaves his other four teammates on the floor to just stand and watch (although, sometimes they do, because he is that good). “He’s one of the best playmakers in the league,” Brewer said. “I loved playing with him because you know you’ll get wide open shots.” On the season, Harden is averaging 7.5 assists. The Rockets are also winning games. After starting the season with an 11-14 record and losing Chris Paul for 17 games. Harden saved the team’s season, scoring 30 points in 32 consecutive games. The Rockets now sit in third place in the Western Conference, and look primed to challenge the Golden State Warriors for the right to advance to the Finals again. When Stoudamire watches Harden operate in Mike D’Antoni’s free-flowing offense, he admits it makes him a little jealous. “I wish I was born a little later in life,” Stoudamire said. Former players are divided on the topic of whether scoring 50 points is easier today or in past eras. Stoudamire believes it is easier because of the restrictions on defensive players, naming the rule to prohibit hand-checking in 2004. Stackhouse says defensive schemes are much more intricate today, making it more difficult for offensive players. Tracy Murray, who scored 50 points in a game against the Golden State Warriors back in 1998, has no doubt which era he would prefer to have played in. “I would have been a star in today’s NBA,” Murray said. “In this era, I would have had a couple more 50-point games, I would have been paid a hundred million more. While retired players tend to romanticize the difficulty of their era, Stackhouse, Murray and Stoudamire do have a point. An NBA record 12 different players have scored 50 points this season, supporting their view that it is becoming easier to set scoring records in today’s NBA. In an era of offensive explosion, perhaps it is even more impressive that Harden has managed to distinguish himself from the pack. 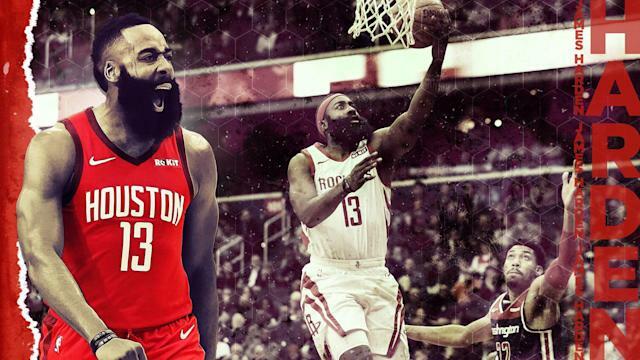 While the MVP debate rages on, players and coaches have already started looking beyond just a singular season award and have started considering Harden’s season from an all-time historical standpoint. Bickerstaff isn’t ready to put Harden ahead of the other great scorers of all-time. But is Harden a one-of-a-kind player having a season that we’ve never seen before?